JOHN WHITMAN is a 6th degree black belt in Krav Maga, certified Civilian Law Enforcement Instructor, and certified Young Warriors Krav Maga Kids instructor. John is also a purple belt in Brazilian jiu-jitsu, a certified CrossFit Level 1 Trainer, and a certified USAW Sport Performance Coach. He is the first person in the world to hold a Senior Instructor degree from the prestigious Wingate Institute in Netanya, Israel. He served as president of Krav Maga Worldwide for 8 years, and has been teaching since 1994. John teaches civilian, military, and law enforcement personnel, and has taught elite military units in the United States and abroad. John is the founder of the Krav Maga Alliance, an international organization of Krav Maga schools with affiliates worldwide. He is co-author of the books Complete Krav Maga and Krav Maga For Beginners. 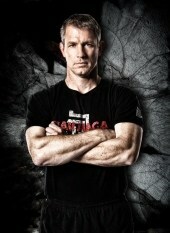 John has been featured in the videos Krav Maga Complete Set and Ultimate Krav Maga. He has “train the trainer” status and has trained most of the other Krav Maga instructors currently working in North America. He contributed significantly to the creation of the certification course used in North America to train Krav Maga instructors. He has appeared in numerous media outlets, including The Today Show, ABC News, and CNN. Jeremy Stafford has a background in Judo, Wrestling, the Marine Corps Martial Arts Program and Police Defensive Tactics. He has been training in Krav Maga for over 12 years and is a certified Black Belt instructor. Jeremy is a Member of the Krav Maga Alliance train the trainer team and also serves as the Director of Police and Military training for the Krav Maga Alliance, where he is in charge of designing the KMA Force curriculum and certifying KMA Force Instructors and Operators. Jeremy is currently a Police Officer with the LAPD. He has been on the job for over 15 years and has worked as a Patrol Officer, Narcotics Officer, a Counter -Terrorism Operator, and is currently assigned as a lead Instructor at the Firearms and Tactics Section where he has been tasked with updating and designing recruit and in-service firearms and tactical training. For his part in designing the LAPD’s counter terror response plan, Jeremy was recently awarded the California Peace Officers Award of Distinction. Jeremy also spent 13 1/2 years in the Marine Corps and Marine Corps Reserve. He has been deployed all over the world in support of the Global War on Terror, including a combat tour in Iraq, where he earned a Bronze Star with a Combat “V” for valor, several tours to Southeast Asia as a Counter-Terrorism liason, and a tour in the horn of Africa as an advisor. Towards the end of his tour in Iraq, Jeremy was assigned to help rebuild the Baghdad Police Department, where he developed the first joint USMC-Iraqi Police patrol program. Jeremy and his development of this program were featured in POLICE Magazine as well as on CNN, FOX News, and Good Morning America. Tony Morrison is a 2nd Degree Black Belt in Krav Maga and a member of the Krav Maga Alliance Training Team. He has train the trainer status awarded him by John Whitman the founder of the Krav Maga Alliance. Tony is also a master instructor in several martial arts disciplines and has been teaching for over 30 Years. Tony has appeared on several television shows such as the View, ABC News, and Mystic Pizza. Casey is the founder and Lead Krav Maga Instructor at Southpaw Krav Maga in Columbus, Ohio. After reading an article listing Krav Maga as one of the martial arts that will actually save your life, Casey was drawn to Krav Maga’s simple, effective, ‘do anything necessary’ approach. As an Interactive Strategist, Casey’s day job focuses on breaking complex objectives into simple achievable steps, a skill that lead to becoming a Krav Maga instructor and one he now teaches candidates as a member of the Krav Maga Alliance Training Team. Casey currently holds a KMA 2nd Degree Black Belt Instructor certification, as well as a Practical Instructor certification from the Wingate Institute in Netanya, Israel. In addition to teaching and training, Casey can likely be found reading, failing to grow a mustache or playing with his pooch, Rosco. In 2005, Giorgio joined Krav Maga Performance Europe and then continued his training with Krav Maga Worldwide here in Europe. In May 2009, Giorgio became a black belt instructor for Krav Maga Worldwide and in November 2009 he received the 2009 Award Krav Maga Worldwide as Program instructor of the year in Europe. In 2010, Giorgio joined the Krav Maga Alliance and in November of 2012, he earned his 2nd Degree Black Belt. Giorgio has been a member of the Training Team since June 2014. Derrek Hofrichter is the owner and Chief Instructor of East Valley Krav Maga located in Tempe, Arizona. He has been a Krav Maga instructor for over a decade, and holds the rank of 1st Degree Black Belt under John Whitman and the Krav Maga Alliance. Derrek also has a Practical Krav Maga Instructor’s diploma from the Wingate Institute in Israel. Alex Nicolas is 3rd Degree Black Belt in Yoseikan Budo and a 2nd Degree Black Belt in Krav Maga with the Krav Maga Alliance. He has also received a diploma as a Civilian Law Enforcement Instructor from Krav Maga Worldwide. Alex is the owner of Krav Maga Sabadell Training Center in Barcelona, Spain. Camron Keshavarz is the Head Krav Maga Instructor at Pure Performance Martial Arts Center in Rockville, MD. Cam’s approximately 20 years of martial arts experience includes a Black Belt in Krav Maga as well as background in Tae Kwon Do, wrestling, and fencing. Cam started training in Krav Maga in late-2009 and became an instructor by late-2012. He is currently a certified 2nd Degree Black Belt Instructor and a member of Krav Maga Alliance’s Train the Trainer team. Outside of Krav Maga, Cam is an accomplished scientist with research backgrounds in biology and applied physics. He currently works for MedImmune as a Formulations Scientist. Michael’s background includes Taekwondo, Jiujitsu, Muay Thai, and Kali. He began teaching Taekwondo in 1992 and started his own program at the age of 15. He began training in Muay Thai and Jiujitsu as a teenager and after a tragic car jacking left him injured and unable to train for a few months, he began questioning his own training. He started searching for something that was designed for self-defense and found Krav Maga in the Spring of 2004. After training for just a few short months he traveled to the National Training Center in Los Angeles, CA to begin his instructor training. He began teaching at Mid-South Krav Maga that year and eventually became the center’s lead instructor. In 2010 he decided to open his own school in Desoto County. Mike currently holds the prestigious rank of 2nd degree Instructor Black Belt and Purple Belt in Brazilian Jiu-Jitsu. Growing up living with gym owners since he was 9 years old, Daniel spent a lot of time learning the ropes and helping out behind the scenes and is now the proud owner of Krav Maga DFW in Dallas, TX. He brings a balanced blend of Krav Maga, traditional martial arts, and sport fighting to his classes. Daniel has over 20 years’ experience in martial arts, earning a 3rd degree black belt in Tang Soo Do and a 1st degree black belt in Han Mu Do, and over the past several years he has also trained in Brazilian Jiu Jitsu, Muay Thai, and boxing. He also has multiple certifications through Krav Maga Alliance, including KMA Force instructor, StrikeFit, and a 2nd Degree black belt in Krav Maga. Tim Leard, a second degree black belt in Krav Maga, has been training and teaching Krav Maga since 2001. In that time Tim has also been certified as a KMA Force instructor as well as earning a Krav Maga Instructor’s diploma from Wingate Institute in Netanya, Israel. A full time martial arts instructor since 1999, Tim is an avid martial artist and fitness enthusiast, Tim has years of experience teaching and working in the martial arts and self defense fields. He is honored to be a part of the Krav Maga Alliance Training Team. Nicola has trained in judo since he was 6 years old. He earned his judo black belt in 1998 and his second dan in 2001. He started Krav Maga in 2003. In 2007, Nicola founded Krav Maga Verona. Nicola was the first person in Europe to join the Krav Maga Alliance, and he earned his Black Belt in 2009. In 2014, he earned his 2nd Degree Black Belt. Nicola is also certified in the Krav Maga Alliance children’s program, a certified personal trainer and kettle bell instructor, and a BJJ practitioner. Julio is a 1st degree Black Belt in Krav Maga, the Lead Instructor of Krav Maga at Combat Sports Academy (CSA) in Dublin, CA. He holds “train the trainer” status as a Krav Maga Alliance Training Team Member. He has been training in Krav Maga for over a decade and has taught since CSA first opened in 2009. Hailing from one of the most decorated Muaythai gyms in the world, Julio has expanded his training by competing in kickboxing and Muaythai. He is also a CrossFit competitor and trains in boxing as well. Outside of the gym, Julio holds a Master’s Degree in Social Work and is Director of Community Services for an organization working with youth and their families in the foster and juvenile justice systems. Katie is a 1st degree Black Belt in Krav Maga and the Program Manager of Krav Maga at Combat Sports Academy (CSA) in Dublin, CA. She held a spot on the 2009 U.S. National Muaythai team that competed at IFMA, the Muaythai World Championships in Bangkok, Thailand. Katie also held the U.S. National Title with the MTAA at 135 pounds. She eventually decided she loved teaching regular people how to protect themselves and their families more than she loved fighting, and went on to focus on her Krav Maga career. As a member of the Krav Maga Alliance Training Team, Katie holds “train the trainer” status, is a certified KMA Force Instructor, and was the 2017 Krav Maga Alliance Instructor of the Year. She is also a member of the Krav Maga Alliance Professional Committee, which serves as the official body tasked with analyzing the KMA curriculum to identify and implement the most current techniques in a system open to evolution. Pawel Cichowlas is a 3rd Degree Black Belt in Krav Maga, certified to train civilian and law enforcement personnel as well as children. His specialties include hand-to-hand combat training, self defense training, defensive tactics for law enforcement and military, defenses against attackers armed with various weapons (blunt objects, edged weapons, firearms), fight scene choreography for movies, and fitness certification. He is the owner and Chief Instructor at Krav Maga Detroit.